Sabaeframe - AYUMI Immaculate craftsmanship exuberating the roundness spirit of this retro style artwear. Immaculate craftsmanship exuberating the roundness spirit of this retro style artwear. Exquisite collection of AYUMI hand-made Celluloid frames from Sabae. Celluloid is being used to produce the AYUMI series of frames, emphasising on the theme `Opimum Beauty`. The material Celluloid evokes a natural beautiful shine and eyeglasses made from it have perfect adamatine lustre. Celluloid features fast moulding, high regidity and brilliant transparency. Over time, the frames would fit perfectly with the facial features of the bearers. There is a very comfortable and smooth feeling with hand-made Celluoid frame. However, Celluloid frames could not be mass produced by machine. All processes from moulding, crafting, polishing etc need to be done manually. Hence, all AYUMI Celluloid frames are hand-made one by one by experienced Japanese crafsmen with decades of experience. Quantity is therefore limited. 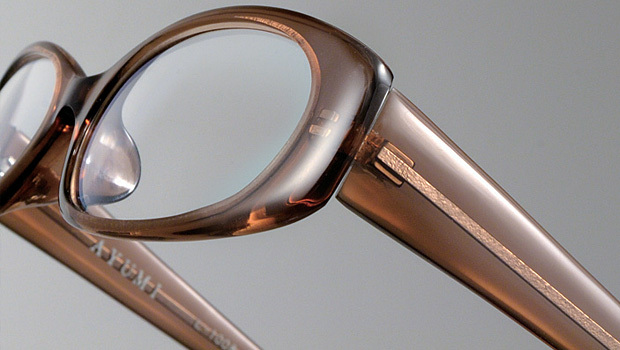 The AYUMI series of frames strive for Optimum Beauty. Each frame is being superstitiously shaped, moulded, cut and polished by very experienced craftsman to bring out the shine and character of each frame. Titanium of similar colour with the frame is employed when joining the main frame with the temples, to exuberate a balanced feel. Special considerations are undertaken to prevent the erosion of shine from foreign properties such as sweat, hair grease and liquid etc. This is being achieved in a way by inserting the joining parts into the temple and sealed back with celluloid to fully cover up. Whole body of the frame, including the nose pads, is being hand crafted from the original Celluloid board, with no joining part at the front frame. This unique craftsmanship ensures that all AYUMI frames are of the optimum beauty, durability and shine with deliberate brilliancy. Copyright 2013 Sabaeframe. All rights reserved.